Photos by Megan Vicente (top), Katy Fulton (left), and Chanda Brietzke (right). The flattop crab is a small porcelain crab (carapace to 2 cm wide) that varies in colour from dark brown or brownish-red to blue. It is flattened and has broad, flat, even-sized claws. 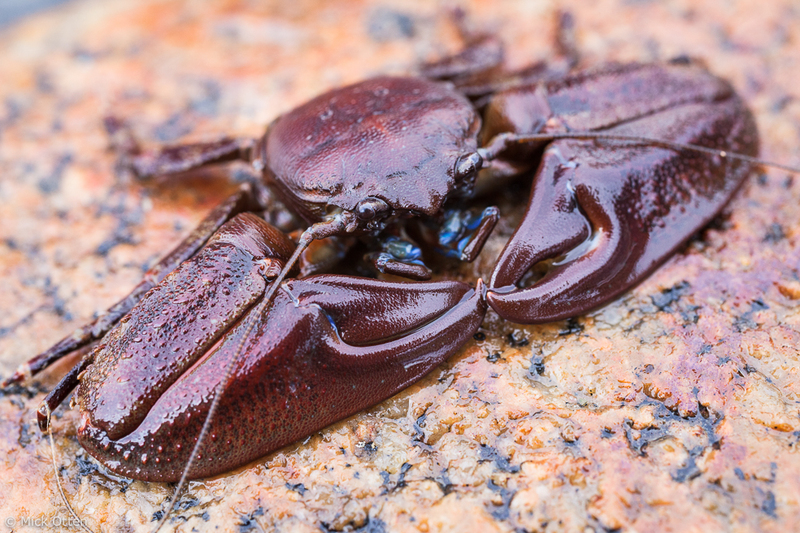 Its main identifying features are blue mouth parts (maxillipeds) and blue spots at the joint of the pincers (chela) - this location is also called the thumb joint. In order to obtain a correct identification the claws or mouth must be open to reveal this blue colouration. This crab can be found under rocks in the lower intertidal of sheltered waters, to a depth of 90 m. Its range extends from southeastern Alaska to southern California. 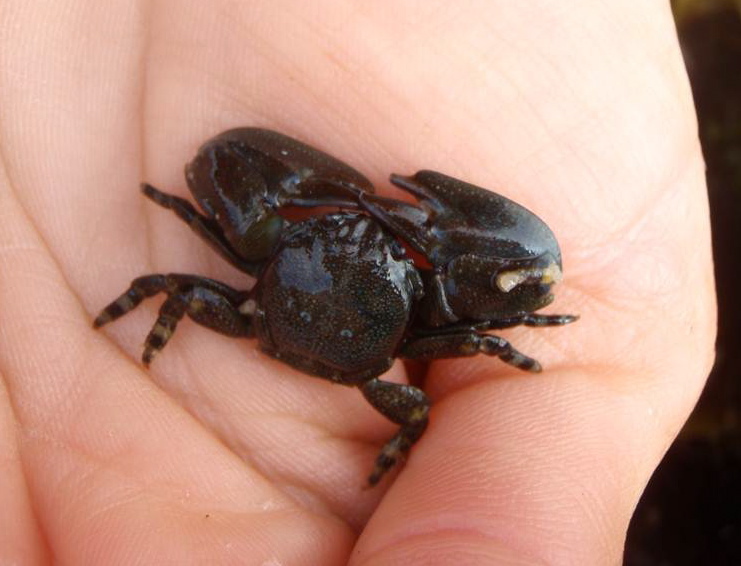 The flat porcelain crab (Petrolisthes cinctipes) is more common along exposed outer coasts. It has reddish-orange mouthparts and claw spots as opposed to the blue mouthparts and claw spots of the flattop porcelain crab. 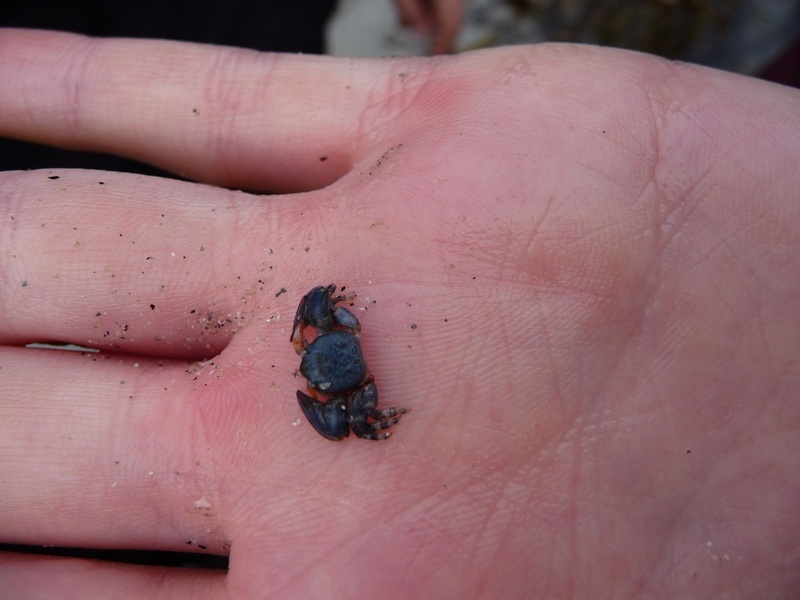 The flattop crab is restricted to the lower intertidal because it can't tolerate exposure to warm air temperatures. The flattop crab is competitively inferior to the flat porcelain crab, but the latter is usually restricted to the upper and middle intertidal because it avoids hiding under rocks that rest on fine sediment. Porcelain crabs are named so because of their tendency to release legs readily, or "break" like porcelain, when disturbed. Harbo, R. M. (2011). Whelks to whales: Coastal marine life of the Pacific Northwest. Madeira Park, BC: Harbour Publishing. P.101. Jensen, G.C. (1995). Pacific Coast Crabs and Shrimps. Monterey, CA: Sea Challengers. P. 75.